Our patented “snap-and-insert” system is the backbone for one of the world’s strongest and most cost-effective wooden crates. Each SnapCrate is made up of a durable pallet base and panels that have “slots” routed into them. These slots are then fitted with nylon inserts that protect the wood from moisture, eliminate splintering, and provide a superior surface for the snaps to grab on to. This engineering feat allows our wooden shipping crates to be easily disassembled, stored flat, and reassembled without using tools or damaging crates. 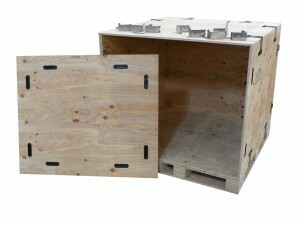 SnapCrates offer superior protection, save time, and will add to your bottom line. Ship Smarter with SnapCrate. Our innovative "snap" technology achieves unbeatable strength, speed and simplicity.